St. Clair and Madison Counties continue to house a powerful plaintiffs’ bar and are notorious for their disproportionate volumes of litigation and large verdicts. In addition to the hyper-litigious culture, the prospects of legal reform are grim despite the state’s desperate need for economic growth and job creation. Excessive tort costs to the Illinois economy result in $4.5 billion in annual direct costs and 81,685 jobs when dynamic effects are considered, according to a recent Perryman Group study. As of 2018, the yearly fiscal losses due to excessive tort litigation are estimated at $397.2 million in state revenues and $335.4 million to local governments. For a state with as dire of a financial situation as Illinois, these costs are extremely concerning. There has been a flurry of “no-injury” consumer class action lawsuits filed around the country challenging how food is labeled and advertised, such as whether the product qualifies as “all natural.” California was ground zero for this type of litigation, but it has quickly spread to other Judicial Hellholes across the country, with the pace hitting nearly 150 new filings annually. St. Clair County has been a magnet for these lawsuits, as 21 such cases asserting that products ranging from cake mix to barbeque sauce are not sufficiently natural have been filed there so far. The Nelson & Nelson law firm of St. Clair County is leading the charge, as they have filed several “unnatural” class action lawsuits over the past few years. Most were voluntarily dismissed soon after filing, which could indicate that companies settled the claims for their nuisance value to avoid the expense of litigation. In one instance, the firm collected $245,000 and the class received nothing. As is most often the case, plaintiffs’ lawyers walk away with hundreds of thousands of dollars in fees, while consumers are left with nothing but higher prices and fewer choices. David Nelson, of Nelson & Nelson, filed multiple class action lawsuits this year on behalf of a St. Clair woman accusing manufacturers of false advertising. Since 2017, that individual has filed at least six false advertisement cases, including four in April and May of 2018 alone. In each of her lawsuits, the plaintiff alleges she was “injured” by paying higher prices for products than she claims they were worth. Among the cases she has filed is a lawsuit against Cedarlane Natural Foods in May 2018, claiming the company’s Gluten Free Roasted Chili Relleno is not “all natural” because it contains a common thickening agent. She also sued Schnuck Markets for falsely advertising the amount of peanuts in a mixed nuts container. The company said that the mixture contained less than fifty percent peanuts, but she claims it was more. Each of her six lawsuits are currently pending. Nelson & Nelson, along with the Armstrong Law Firm of St. Louis, has filed similar class action lawsuits against food makers in St. Clair County. The stakes are high for the plaintiffs’ lawyers bringing these lawsuits. St. Clair County Circuit Court held 13 civil trials in 2017, and plaintiffs were awarded a total of $4,046,499.82 in ten of those cases. There were only three defense verdicts in all of 2017. Madison County continues to be the preferred jurisdiction by trial lawyers bringing asbestos claims, with 1,128 cases filed in 2017. This is a 13.4% drop from 2016; however, Madison County had almost triple the number of filings of the next closest competing jurisdiction, Baltimore, Maryland (495). One of the leading firms driving the Madison County asbestos litigation, Maune Richle, increased its filings by 4.1 percent in 2017. From 2014-2017, plaintiffs’ lawyers filed 6,071 asbestos cases in Madison County, and 68% were on behalf of people who do not live in Illinois, let alone Madison County. Plaintiffs flock to the Madison County courthouse because of its plaintiff-friendly reputation, low evidentiary standards, and judges’ willingness to allow meritless claims to survive. While Madison County continues to be the most popular jurisdiction for asbestos litigation, St. Clair County’s filings have been on a meteoric rise over the past two years. The county filings increased by 200% in 2017 from 69 in 2016 to 207 the following year. A large reason behind this sudden increase is the Missouri legislature’s enactment of a stronger standard for the admissibility of expert testimony in March 2017. Following this change in law, asbestos-related filings dropped in St. Louis, Missouri (another perennial Judicial Hellhole), by 40.3% and increased across the river in St. Clair County by 200%. The Daubert standard requires judges to act as “gatekeepers” to prevent “junk science” testimony from being heard at trial, making it much more difficult for plaintiffs’ attorneys to be successful with dubious asbestos claims. The vast majority of the asbestos lawsuits now filed in St. Clair allege that exposure to asbestos caused a person to develop lung cancer, which has other causes. In May 2018, the St. Clair County Circuit Court heard its first asbestos case since becoming one of the trial bar’s preferred jurisdictions. The case settled prior to closing arguments after Judge Vincent Lopinot denied multiple defense motions and barred the defendant from presenting evidence that the plaintiff was exposed to asbestos while employed by others. 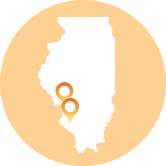 Unfortunately, Illinois has not been immune from the opioid epidemic and St. Clair and Madison Counties are looking to receive monetary relief through the court system. Brendan Kelly, the state’s attorney for St. Clair County, has moved forward with an opioid lawsuit against Purdue Pharma and Abbot Laboratories, accusing them of deceptive advertising and consumer fraud that contributed to opioid and heroin overdoses. Multiple plaintiffs’ attorneys had a hand in filing the complaint. Madison County’s state attorney, Tom Gibbons, also is looking into filing an opioid lawsuit on behalf of the county. He recently submitted a series of written answers in response to questions put forth by Madison County Board member Phil Chapman (R) and the Judiciary Committee. Included among the questions was how much money the county might be expected to gain from a lawsuit, how the money would be spent, and then most importantly, questions regarding the ethical concerns over the bidding process to select an outside private law firm to handle the case. The opioid epidemic is a serious public health crisis, but regulation through litigation is not the solution. The public health interests need to be the main priority, not the personal financial interests of the trial bar, which become the focus when outside private attorneys are hired to represent government entities. The Illinois legislature once again failed to advance commonsense reforms in 2018. H.B. 4249 would have elimi- nated venue-shopping and made it more difficult for plaintiffs from around the country with no connection to Madison and St. Clair Counties to flock to those courthouses. The bill also would have made positive changes to the joint and several liability law and would have limited how much could be recovered for medical care and treat- ment expenses to the amount actually paid rather than amount initially billed. This section would prevent plaintiffs from receiving “windfalls” at the expense of defendants at trial. The bill was introduced in January but failed to gain any traction. Pro-business Governor Bruce Rauner (R) failed in his bid for reelection and was defeated by J.B. Pritzker (D) in November of 2018, further decreasing the likelihood of reforms passing in the near future. Legal reform legislation also faces an uphill battle in Illinois because some people embrace the counties’ Hellhole status. Plaintiffs’ lawyers argue it is good for the area and community because it leads to an increase in court filing fees, and increased business and tax revenue generated by new satellite law offices opening in the counties. This ignores the fact that lawsuit abuse drains the economy and drives businesses out of the state, as pointed out above by Mike Walters. Companies know that they do not face a fair and balanced playing field in the courtrooms, and as a result, choose not to do business in the state, taking their revenue and jobs with them.